We are prominent names in the industry for offering a wide range of PVC Cable Channels. These channels are manufactured using plastic and other polymers. The products offered by us have been acknowledged because of the countable performance. Our PVC cable channels are available in varied specifications and sizes and suitable to be used across diverse industrial applications. We offer an implacable range of PVC Cable Channels to our prestigious clients. The products offered by us have been acknowledged across the globe because of the countable performance delivered by them time after time. 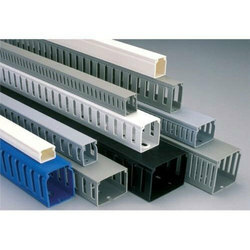 Our mono duct brand PVC channels are available in varied specifications & sizes and are thus suitable to be used across diverse industrial applications.